International Standard, The. A Magazine Devoted to the Discussion and Dissemination of the Wisdom Contained in the Great Pyramid of Jeezeh in Egypt / A Magazine Devoted to the Preservation & Perfection of the Anglo-Saxon Weights & Measures and the Discussion and Dissemination of the Wisdom Contained in the Great Pyramid of Jeezeh in Egypt. Cleveland, OH. Publisher: International Institute for Preserving and Perfecting Weights and Measures. 1/1, March 1883. 76 pp., $2.00 a year, but free to dues-paying members of the association. 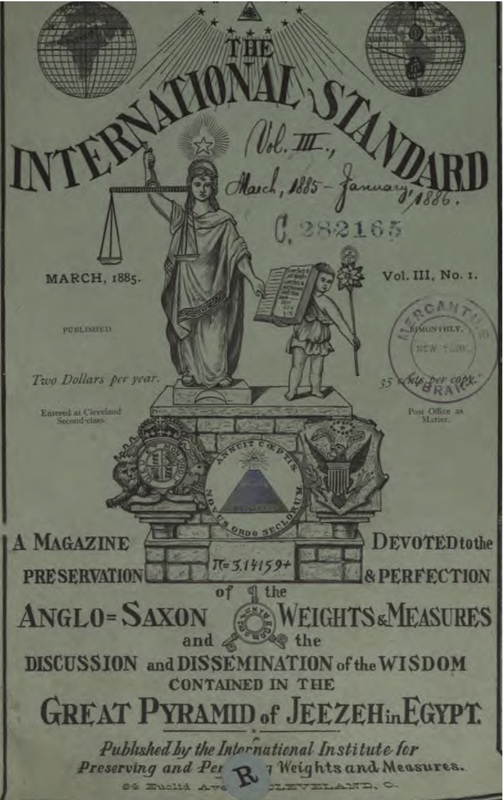 The official organ of The International Institute for For Preserving and Perfecting the Anglo-Saxon Weights and Measures (which were, in the Institute's view, based on the Great Pyramid of Giza). An outlet for anti-metric system propaganda, the theoretical Egyptology of Charles Piazzi Smyth and his followers, and other occult topics. Edited by Charles Latimer, C. E.: railroad system architect, occultist and master dowser. Notes a lecture before the association by "Prof." George Henry Felt, a member of the association, in May 1884 on "Measures Used by the Ancients." Advertised in Notes and queries, 4/11 (November 1887).